robin hood: Will the Bowman, the forgotten outlaw. Amongst the statues of Robin Hood's outlaws at the base of Castle Rock, Nottingham, is a figure no-one today recognises. (I myself thought it was Much the Miller's son). It is in fact Will Stutely, also known as Will the Bowman, an outlaw now all but forgotten, but certainly known to avid readers of Howard Pyle's "The Merry Adventures of Robin Hood", published in 1883, and the main source of entertainment for all things Robin Hood until Hollywood came along. Will Stutely is not mentioned in the very earliest ballads about Robin Hood, and most researchers believe his creation in literature is based on a confusion with Will Scarlet, (a.k.a. Scarlock, Scadlock, Scatheloke, etc.) However, because there are a few stories where Will the Bowman and Will Scarlet appear together, he is worth investigation. Above: Bill Owen as Stutely in "The Story of Robin Hood". 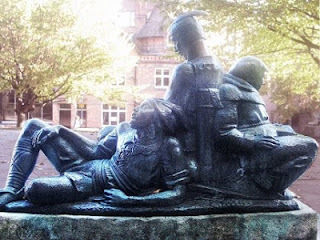 Will "the Bowman" Stutely is included in the Nottingham statue because this site below the Castle is where (according to local legend), he was rescued from the gallows by Robin Hood, having been found guilty of spying on the Sheriff of Nottingham. However, thrilling as that story might be for the tourist trade, it is flawed. Firstly, it was Little John who actually cut Stutely's bonds and fought off the Sheriff's men alongside Stutely until Robin got there. Secondly, a much more likely site for the hanging was Gallow's Hill (junction of Forest Road E / Mapperley Road), where outlaw bodies would be left swaying in the wind at the entrance to the town as a warning to others. 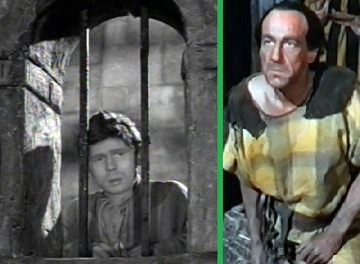 Once a member of Robin Hood's Merrry Men Will Stutely is sometimes credited as being the person who gives John Little his outlaw name, (a credit which also goes to Will Scarlett), and being the person entrusted by Robin to find Alan A Dale who was trying to save his future bride from an arranged marriage. 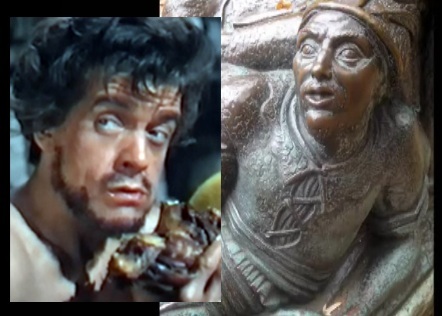 His most prominent film appearance to date is in Walt Disney's excellent "Story of Robin Hood" (SEE THIS LINK), which includes Stutely, Scathelock, and Scarlett! The 1950s TV series "Adventures of Robin Hood" (SEE THIS LINK) also made good use of Will Stutely's rescue from the gallows. Above left: Robert Desmond as Will Stutely in 1950s TV "A Guest for the gallows". Right: Michael Hordern appeared alongside Bill Owen as Scathelock (neither Stutely or Scarlett) in "The Story of Robin Hood". My video of the locations in which outlaws were hung in Nottingham can be seen on this link: Nottingham Executions.